The chain stitch is not as widely used as the lockstitch or regular straight stitch. It is a form of decorative embroidery in which chain like stitches are looped together to form a pattern. It has been used for sealing grain bags, finishing the hems and side seams of jeans, and as a safety stitch on garments which may need to be taken apart eventually. Some sewing machines which do chain stitching also have the capability to do other types of stitches like the cover stitch. A few may also serge as well while some are solely dedicated to chain stitching. I will be looking closely at three models of the chain stitch machine. When any chain stitch machine makes chains, they are formed on the underside of the garment. The type of stitching which results makes it ideal for use on waistbands and the side seams of trousers which need added stretch. As an embroidery stitch, the chain stitch is also used to create decorative designs on the necklines of garments. No need for a specialized embroidery machine. Most machines for home use are never for a single purpose and this one is no different. You can also use it to do cover stitching to finish off necklines, hemlines and cuffs. This cover stitch also facilitates stretching as well, so it is perfect for use on knits and other types of stretch fabrics. 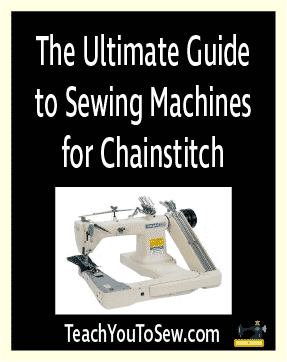 Unlike a serger sewing machine, the chain stitch and cover stitch machine can stitch at any position on the fabric. 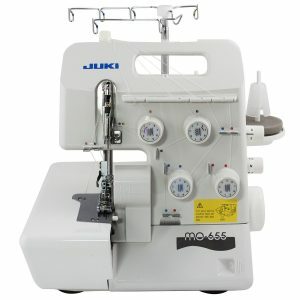 The Juki MCS-1500 is made to accommodate 4 spools of thread. Only 2 threads are needed to form a chain stitch and 3 or 4 for a cover stitch. It comes with a standard presser foot which can be raised and lowered by using a lever. The front of the presser foot is designed with a higher upward curve to ensure that fabrics can easily be placed under it at the start of stitching. The presser foot can be raised to between 8 and 10mm to accommodate thick layers of fabric or adding bulky notions. The pressure of the presser foot can be adjusted based on the fabric you are working with, to provide added ease or added hold. This machine can accommodate three needles and the looper can be easily threaded by just pressing a button to lower it. The adjustable differential feed allows for smooth and even sewing every time. Since the chain stitch can be created at any position on the fabric, not just the edge as with overlockers sewing machines, there are seam guidelines on the extension plate to use while sewing. The features are complete with a sewing light and an exterior thread cutter at the side. If you really don’t need a chain stitch machine with four threads, this next machine may be what you are looking for. 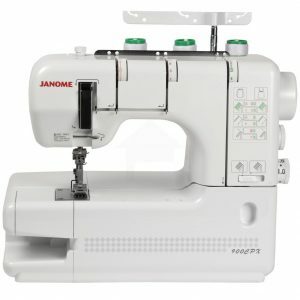 This three thread machine by Janome uses one or two needles to create its stitches. 1 needle to create a 2 thread chain stitch and 2 needles to create a 3 thread cover stitch. I like that is has a seam tightening system or STS, which allows for the secure formation of stitches. It operates at 1000 stitches per minute, has a large sewing bed and an adjustable differential feed. The colour coded diagram assists with threading and you get a basic tool kit and accessories with this package. If you are looking for a multi-use machine which provides the functions of a serger as well as chain stitch in one, then this final machine is a perfect fit. Designed to accommodate 5 threads, this machine performs 2 needle overlock stitches as well as a chain stitch. The knife can be adjusted via the lower knife adjustment knob to accommodate the chain stitch and also flatlock stitching. The differential feed allows for even stitching and the thread tension dials also facilitate smooth operation. The colour coded threading system provides simplification when threading. In my opinion, if you don’t want to have to purchase a chain stitch machine separate from a serger, this is an economical option.